I’ve never been a fan of mayonnaise. I’ve never been one to slather it thickly on a sandwich or sneak a spoonful of it or use it, heaven forbid, as a dip. Blech! Even recipes that rely on large amounts of it for creaminess (potato salad; slaw) make me nervous. I don’t want to taste it, I just want to use it as a glue on a sandwich or as the otherwise unnoticeable base of a salad or slaw. But then I discovered the tomato-mayo open-faced sandwich. I could ask where it’s been all my life, but I already have the answer: in the American South, served up on a hot day, probably alongside a pitcher of sweet tea. That’s why I — Yankee by birth, Midwesterner by college/first-job choice, Mid-Atlantic…er… by current situation — was unfamiliar with it. But man, I was missing out. Because when you take delicious, quality bread, toast it gently, spread it with mayo, heap on freshly sliced tomatoes, and sprinkle a little salt on top, you get a transcendent summer sandwich. Now, tomato-mayo sandwich purists might balk at my usage of anything but grocery store white bread, but come on, that’s not my style. I used a white sourdough here and it was perfection. I recommend something neutral in flavor; this isn’t the place for your seven-grain swirled rye masterpiece. In case you’ve never made one before, here is my take on this summer delight. I can’t wait till I have my own garden-fresh tomatoes to use in it. Come on, summer! Lightly toast bread. You want it just a bit crispy, but not at all blackened. 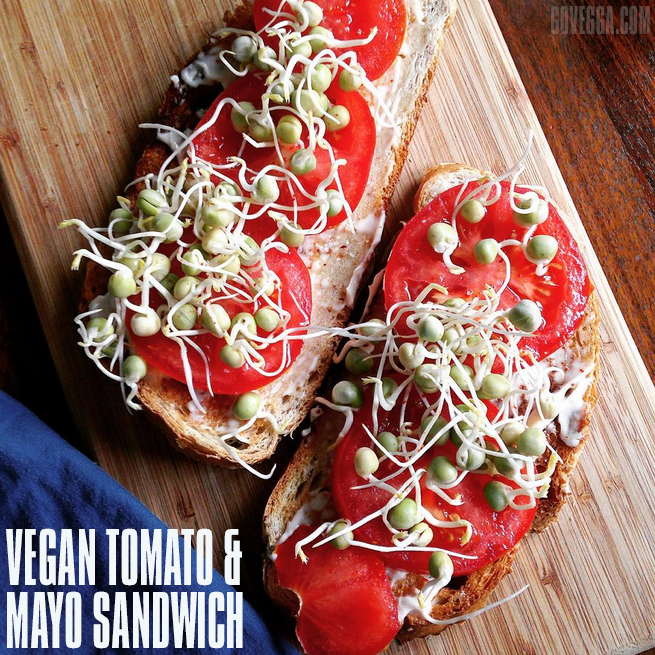 Spread mayo on one side of each slice to taste, then layer on the tomato slices and sprouts (if using). Sprinkle sea salt and pepper flakes (if using) on top. Eat and enjoy.